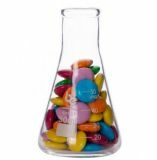 Small wide neck 50ml tough conical flask made from heat and smash resistant borosilicate glass (similar to Pyrex). These flasks are often used by bars to serve mixers for adding to cocktails etc. Its made from tough borosilicate glass which can withstand boiling water or liquid nitrogen. This makes it ideal for use as a prop in Harry Potter or Breaking Bad themed parties. We sell lots of our bar laboratory equipment to cocktail bars for serving mad scientist style drinks. 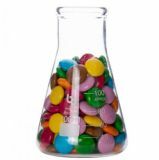 Conical flasks are laboratory glassware that is designed so that the liquid contents can be swirled or stirred without spilling. The narrow neck also reduces the loss of evaporating contents. These flasks can be heated - but please avoid flames touching the glass by using a fine wire gauze between the heat source and the glass. Diameter of neck (external): 37mm. Material: durable 3.3 Borosilicate glass. Graduations: 20ml, 30ml, 40ml, 50ml. Empty the glassware before autoclaving. Rinse thoroughly with distilled water to remove any corrosive or reactive liquids/material. Remove any lids and stoppers. Open any stopcocks or valves. Do not overload the autoclave. Remove any PTFE tape that may have been applied to any joints. Borosilicate glass has a low thermal expansion coefficient and high chemical resistance, making it ideal for use in laboratories and the medical and pharmaceutical industries. All the boroscilate glass on our website is Type 3.3 borosilicate glass. Type 3.3 is named because of the coefficient of expansion for borosilicate glass is 3.3x10-6K-1 (20 - 300C). Do not use any glassware which is scratched, chipped or cracked. Defects like these can seriously weaken the glass and make it prone to breakage in use. Never soak glassware for long periods in very strong alkaline solutions as it will damage the glass. Ultrasonic cleaning is a good method of cleaning glassware thoroughly. Using an ultrasonic cleaner with a mild detergent will clean most residues from the glassware. Always provide adequate support to glassware at the base. Do not lift, carry or suspend glassware by the neck, rim or side arms. Hydrofluoric acid, hot concentrated phosphoric acid and very strong alkalis attack and weaken borosilicate glassware. The maximum recommended working temperature for borosilicate glassware is 500C (for short periods only). However, once the temperature exceeds 150C extra special care should be taken to ensure that heating and cooling is achieved in a slow and uniform manner. Heat vessels gently and gradually to avoid breakage by thermal shock. Similarly, allow hot glassware to cool gradually and in a location away from cold draughts. If using a Bunsen burner with borosilicate glassware employ a soft flame and use wire gauze with ceramic centre to diffuse the flame. Do not directly heat glassware on a hotplate as this can create hot spots on the glassware which may cause the glassware to shatter. 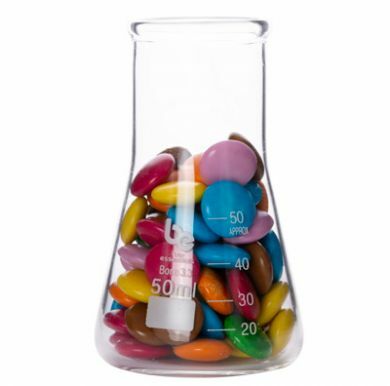 Our range of laboratory glass and plasticware is designed as a novelty way to serve drinks. It is not CE-marked (Not Government Stamped) - ie it is not designed for measuring servings of alcohol. Please use a government approved measuring device (CE-marked) when measuring alcoholic drinks. Bar Essentials is a range of laboratory-style novelty borosilicate glassware and plasticware that has been created for serving drinks or canapes etc. Bar Essentials is not designed for measuring alcohol. Bar Essentials glassware is manufactured from a thicker gauge of tough borosilicate glass than standard laboratory glassware - so can withstand more of the knocks and drops experienced in a cocktail bar environment.